Hi, thanks for stopping by! 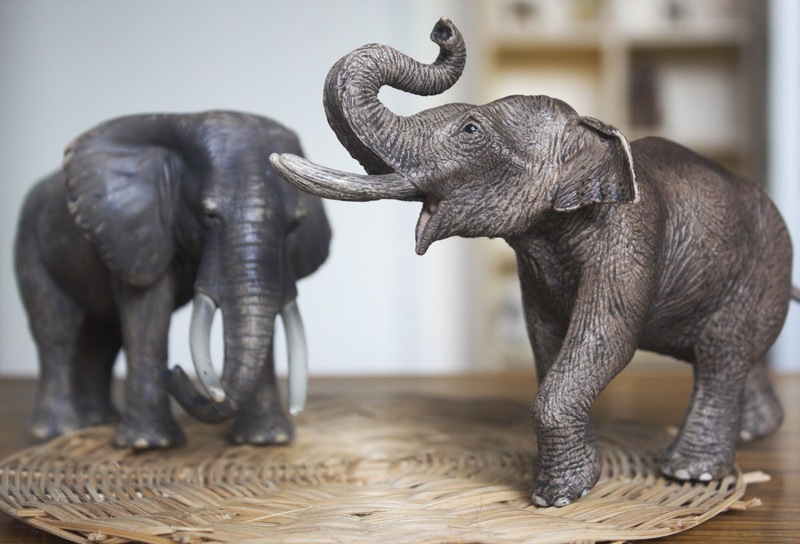 I am here today to share with you some ideas for activities with animal figurines. They are one of the best toys you can purchase for your kids. I can not speak highly enough of the educational value they brought to our life, and the fun too- they are not only my son's favourite toys (he plays with them several times every single day), they are aesthetically pleasing and playing with them is a fantastic sensorial experience due to their weight and their diverse textures. 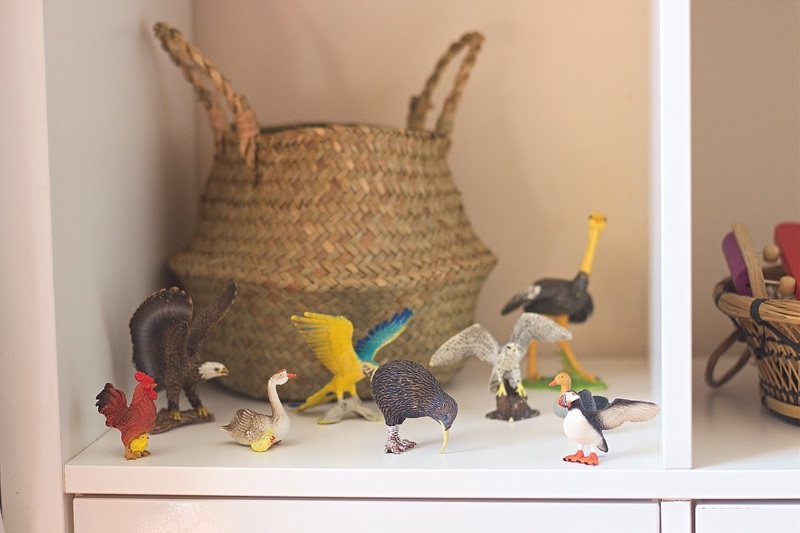 We started collecting the animal figures because we strongly believe that following the child's interests is one of the best ways to help him learn (and my son's love for the animals was born very early). They immediately became the favourite toys of his, and since that day they go through life together 😊95% of our figurines were purchased second hand, so we managed to build a large collection at a very, very low cost (kept it eco-friendly and pocket-friendly; the figurines are non-biodegradable, and we saved them from being transferred to landfills). They encourage my son to learn more about animals, they help him understand and really experience what the differences between the species are. His knowledge about animals is huge, he not only can name and recognize a few hundreds of them but also knows where they live, what they eat (only herbivore at the moment), can name their body parts. I know that the figurines and some of the amazing books that we own helped him to really research the topic. They are wonderful, but please, please, please do not feel obligated to buy any toys that are being recommended by bloggers/ vloggers/ anybody else in this world, because all your child really needs is unconditional love, nutricious food, contact with the nature, care and the sense of security. The rest- the toys, the room decorations, all the fancy stuff is just an addition to her or his life, and it is totally up to you if you want to buy them. One more thing I need to mention is that some of the figurines may not be safe for babies, as some of their parts are sharp (like the musk ox's horns). I categorized the activities into three groups: beginner friendly, intermediate and advanced. Now, this is only to guide you, all kids develop slightly differently, so please do not feel bad if your kid didn't master one of the skills mentioned yet. All of the activities are very engaging, most of them are hands-on and Montessori-inspired (presented slightly differently than the standard on the tray Montessori way). 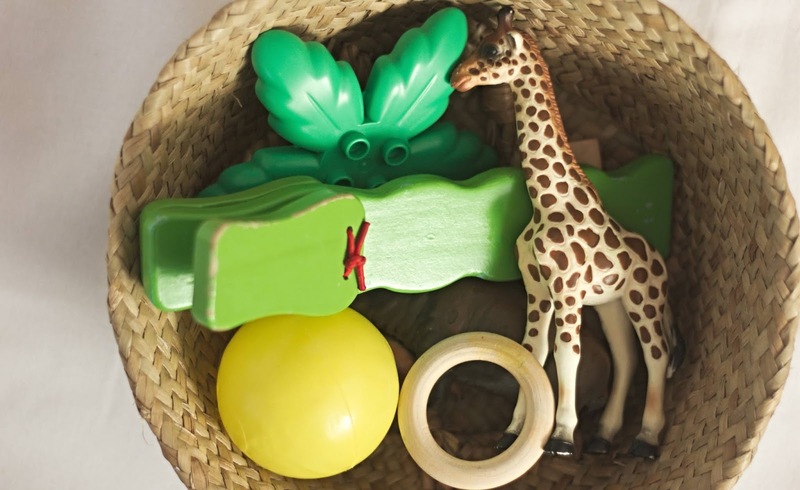 A discovery/treasure basket is a basket filled with items that your child is welcomed to explore with all his senses. When choosing the animals, please ensure that they don't have sharp parts that could hurt your baby. This giraffe is just perfect, it has some weight to it, but it isn't as heavy as some of the animals we own, for instance the elephants (Schleich), the musk ox (CollectA) or the mammoth (Schleich) that you will see on some other photos in this guide. This is an old Schleich giraffe (released in 1998). So this is the activity where a parent/ career can be creative. The sensory play is crucial for the child's development because we experience and learn through our senses. It is essential to stimulate them. Setting up a sensory bin is easy. All you need is a fairly large container (a plastic box/ a pan/ a shoe box / a bowl), some filling (you can use paper shreds, water beads, sand, kinetic sand etc.) and animal figures. You can obviously add some other items if you wish. If you provide your child with a spoon, they can also practice scooping and transferring the animals to a different container. A pair of tweezers or tongs will be fantastic, it will help to develop their fine motor skills. A magnifying glass can help the child to spot characteristics of animals. If you don't have any of these tools, do not worry. Your child will have so much fun anyway. The ideas for sensory bins are endless, and because you use the items you already have at home, they are zero cost! Depending on where in the world you are, you may be lucky to see different animal species at large. We live in England, so Kian sees crows, squirrels and foxes on a daily basis, but we won't really see an elephant in his habitat here. 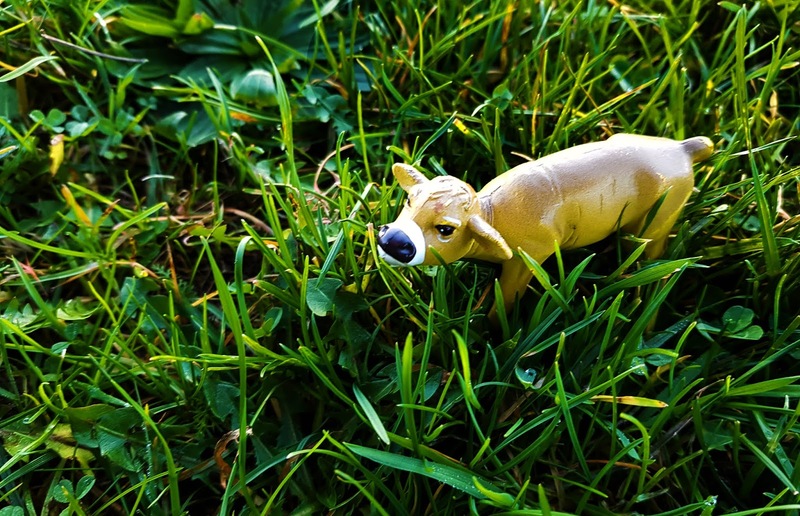 Sometimes we take the figurines (one at the time, so Kian can always remember to keep an eye on it) on our nature walks, and it helps my son to visualise how would the real animals look like in their natural environment. Well, the calves are quite common in Europe 😃, but it is still fun to take them outside on the grass. This one here is by AAA. Matching is one of the basic math skills, so it is important to practise it. I never thought that it would be so interesting for toddlers and babies, but it really is. I introduced Kian to matching activities when he was a few months old. He is 2.5 now, and he still loves them. Sometimes, when we read books, he stops me in the middle of the sentence, saying: Mum, wait a moment. I have got a beaver, let me quickly match it! 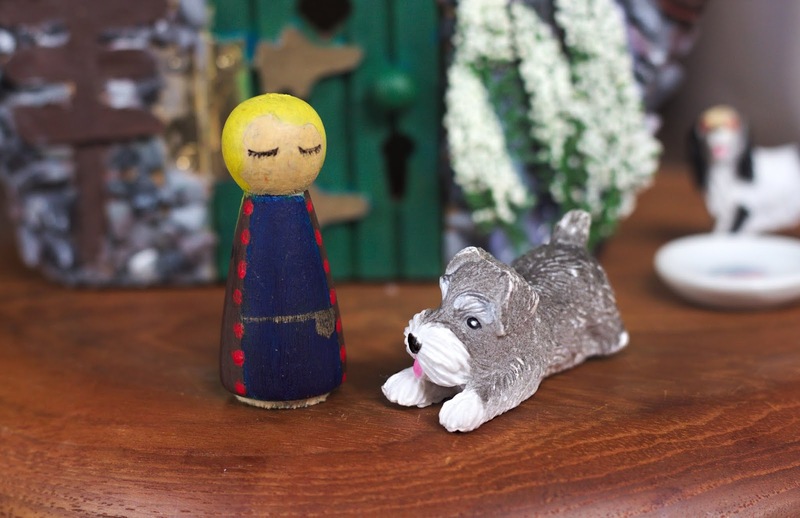 ', and off he runs to his shelf, picks the figurines and matches them excitedly. This may seem very obvious, but the process of learning new species is endless, simply because not all living animals were discovered and named yet. When you realise that your baby is excited any time he sees a particular animal, follow his lead and teach him the name of that animal, and the sound he makes. And then, obviously, you can expose your child to even more words, name what the animal does, or how he looks like. And because when your child is really interested in something, he is in a flow state, he absorbs all the information you give him, he is fully involved and focused. He enjoys the learning process. 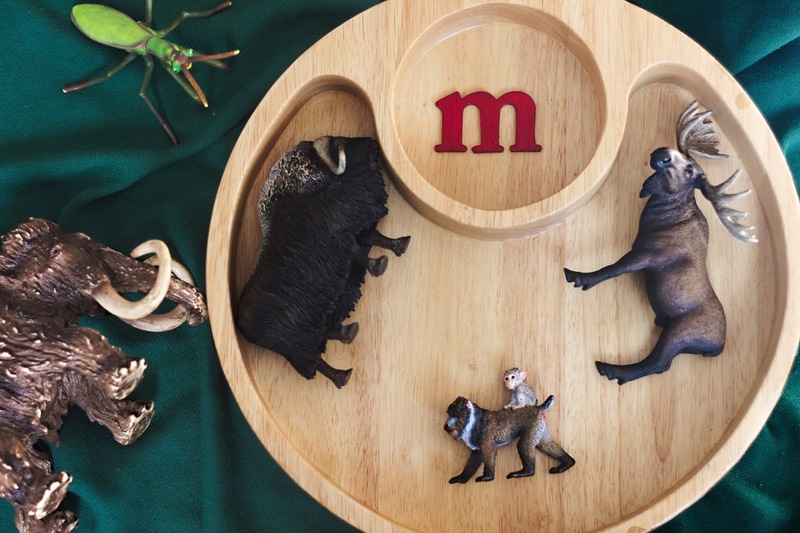 The classic Montessori 3-part cards can be very helpful, but you can also use a book about animals to teach your child animal names and sounds. 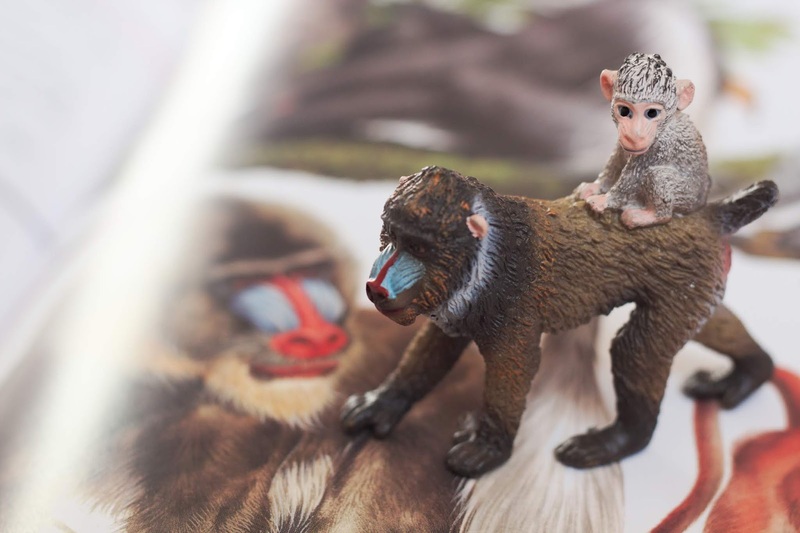 If the photos (and, if possible, seeing the animal in real life) are paired with a figurine, it gives your child a better sensory experience (sight/ hearing /touch). 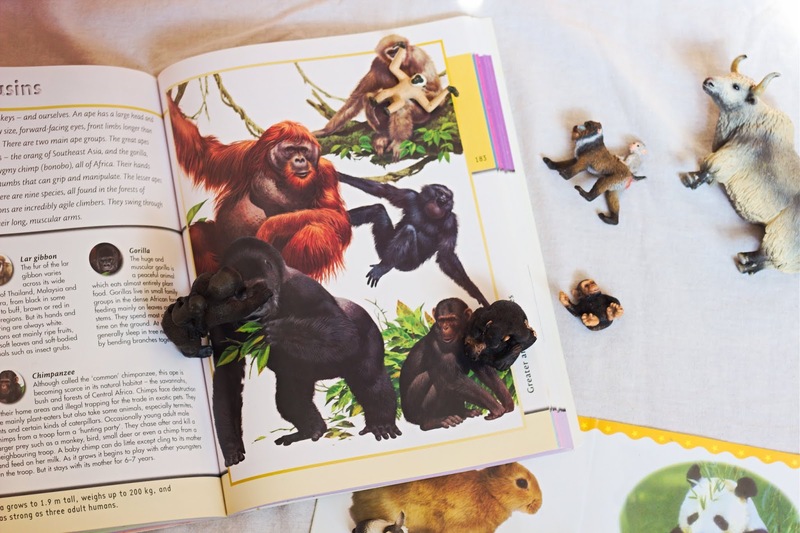 No matter if you read a fiction or non-fiction book to your child, you can make it more fun by tossing in the animals that appear in the book. Try this tip out, especially if your child doesn't like reading books. I believe it will be helpful. 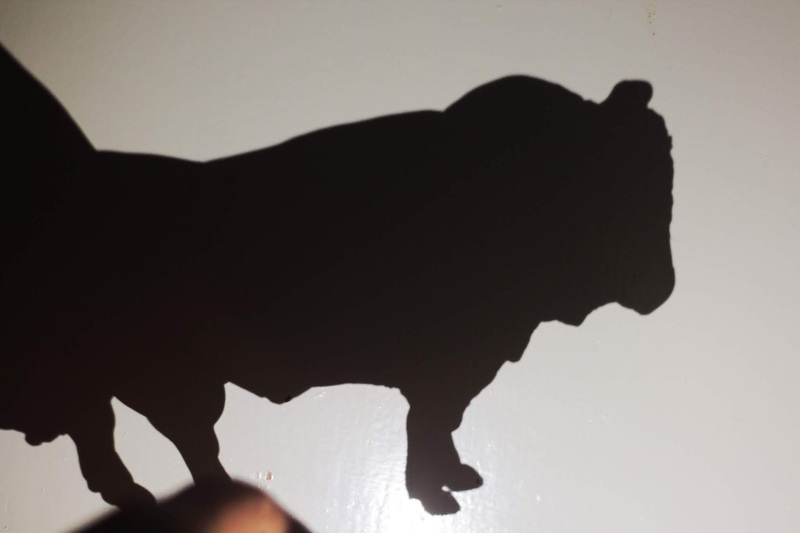 This is a shadow of a Hereford Bull (Schleich 1995). All you need for the animal shadow play is a dark room, a torch, and some animal figures. 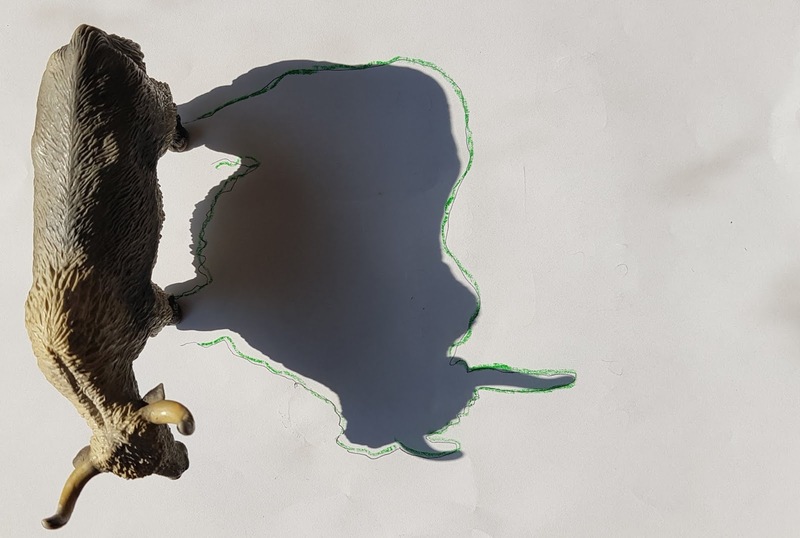 You can start off by encouraging your child to guess what animals the shadows belong to, and then make a shadow play theatre. It is entertaining not only for kids but also for the parents :) When Kian was younger, it was a part of our evening routine, and we still do it quite often nowadays. Discovering animal tracks in nature is very fascinating, not only for kids but also for adults. To prepare your children for this outdoor activity, you can practice at home so they can understand what you will be looking for outside. 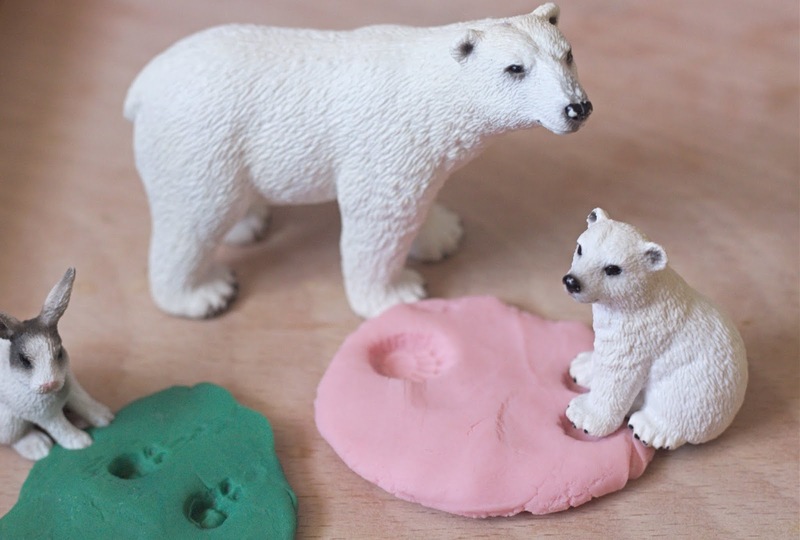 All you need is either a home-made or the store-bought playdough and some animal figures. This activity will keep your kids busy for long! Scooping and transferring are fun ways to practice fine motor skills. 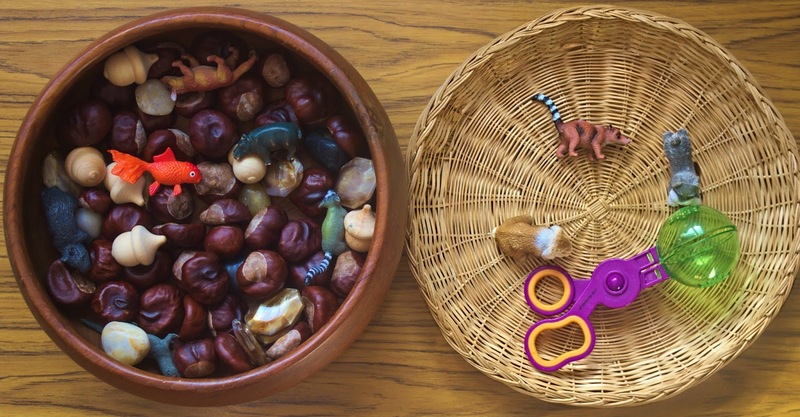 All you need to set up this activity are two bowls/ boxes, one of them empty, and one filled with the tiny figurines and kinetic sand/sand/shredded paper/ conkers, and a tool that will help your child to scoop and transfer the animals from one bowl to the other. I recommend using what you already have at home, a spoon or a ladle would be perfect. The handy scoopers that we use are great, it takes some time for a toddler to get used to them, but they will get him ready for using scissors. This is a wonderful activity that supports the development of a child's visual analysis and synthesis skills (crucial for early literacy and numeracy skills). It is very simple to set up, you just need animal babies and their parents (or one of them), and ask your child to match the animal to their young. 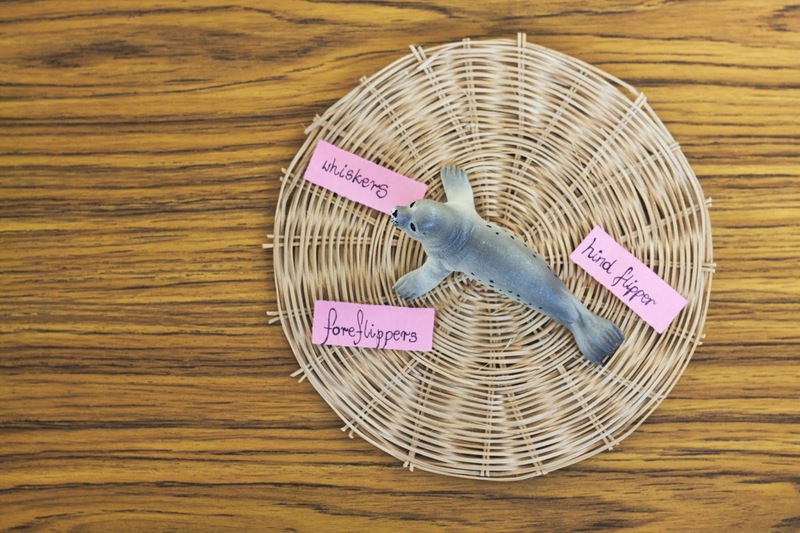 Animal figures can make learning the opposites effortless. You can start off by explaining the size difference (big vs small) or the weight difference (light vs heavy) of some of the figures, and help your child to sort them into groups. 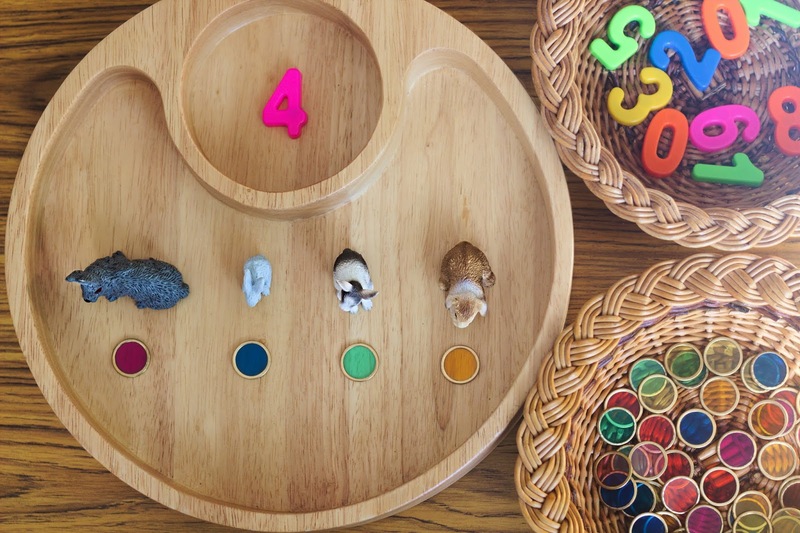 Sorting is a beginning math skill, so thanks to this activity your toddler will not only learn the opposites but also start applying logical thinking into everyday life. This simple activity supports the development of sorting skill as well as colour knowledge. To set it up, I used a few pieces of colour paper that I laid out on a table (if you have paper plates or bowls in many colours they will be perfect too), and animals on a small tray. Your child can sort only animals, or you can toss in some more objects if you wish. 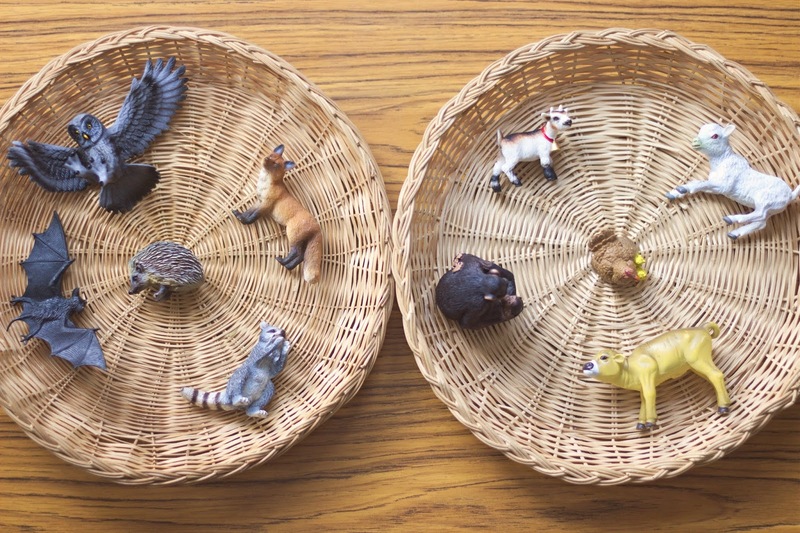 Your child can practise the visual discrimination through matching the animal skin covers to animal figurines. You can print the close-ups of skin covers off of the internet. I made mine using the A4 Animal Print Card that I randomly found in Wilko. It used to be my son's favourite activity when he was 1.5-2 years old. 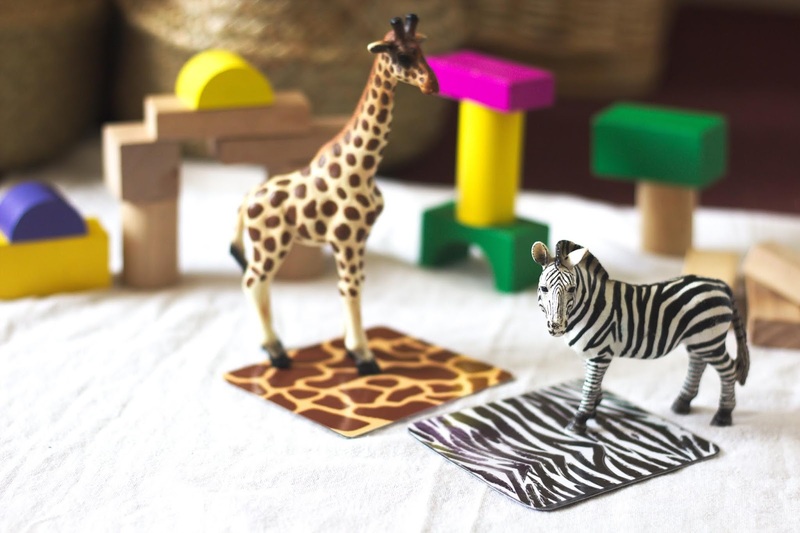 Animal figurines are perfect for incorporating to block play (even Lego Duplo), loose parts play or doll houses. And here- the sky is the limit. 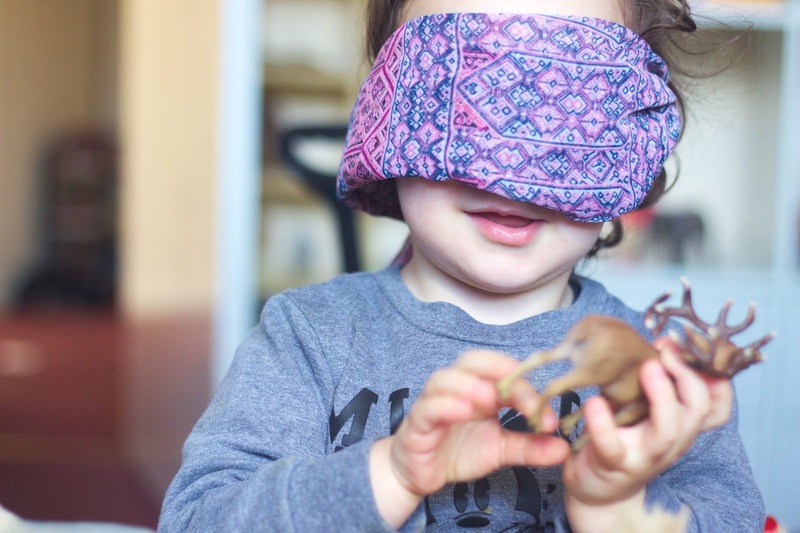 If your child doesn't initiate the play, you can prep an invitation consisting of some blocks, loose parts, animal figurines or scarves that you already have at home. They will immediately start creating a small world with the items you provided, and you will be blown away by their imagination. This activity is great because it literally grows with your child. The older and more advanced your baby is, the more play possibilities will appear. There are many different ways of sorting animals, for example- animals with tusks vs animals without tusks. Mammals vs reptiles, animals with wings vs animals without wings. 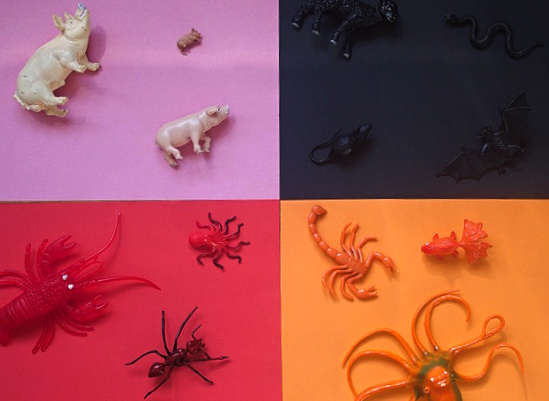 You can introduce sorting very early, even when your child only knows 2-3 animals. And then ask him to sort cats with cats, sheep with sheep and dogs with dogs etc. Once he gets the idea, he will ask for more activities like this, which would be an awesome opportunity for him to learn more animal names and their body parts. Animal rescue is a fun activity that helps to develop fine motor skills and critical thinking. 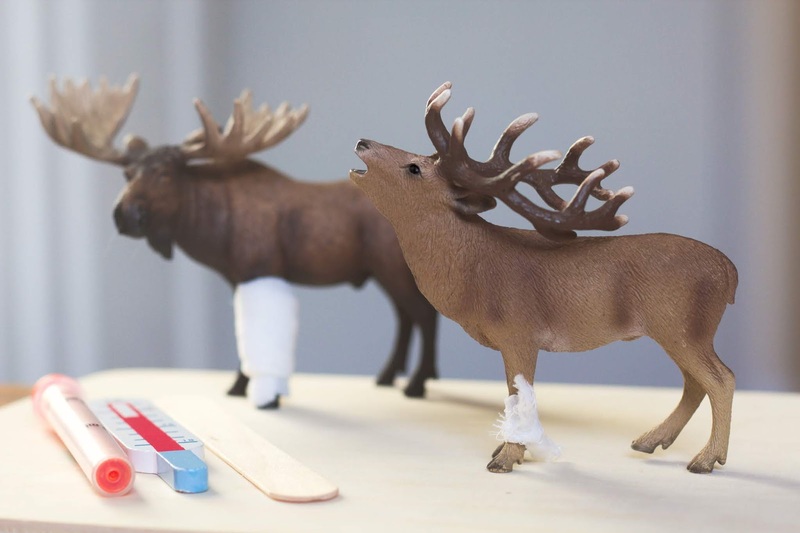 You can prepare many different variations of it (like sticking animals to a flat surface with washi tape, putting several elastic bands on the figurines etc. ), I, however, decided to thread some jute twine through the holes of the clothespins basket, and I asked my son to rescue the little animal figurines using tongs. This simple activity will help your child to understand that some animals live mainly in the air, water or land. You can set it up in many different ways. 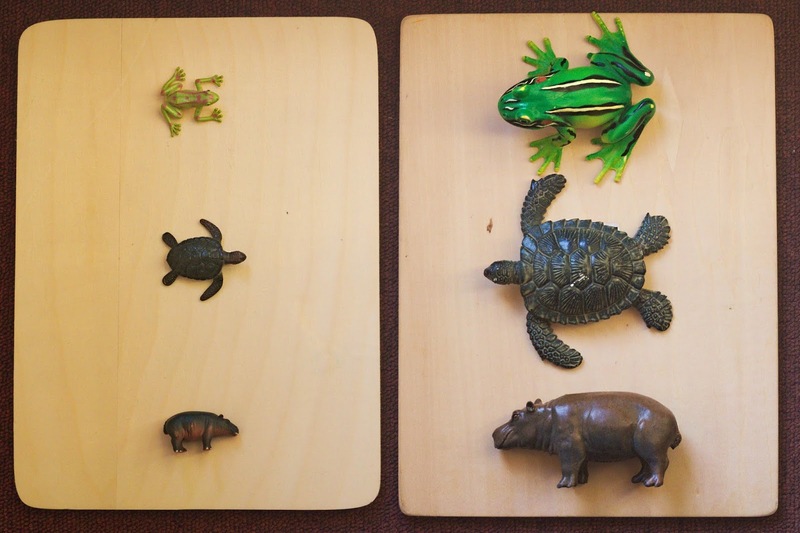 You can have photos of an ocean, land and sky and ask your child to sort the animals into three groups. The other, and fun alternative, is displaying three jars: one 'empty' (containing the air), one with water, and one with sand/ soil and grass. If your child can read, you can just write the words 'land', 'air' and 'water' on small pieces of papers, and ask your child to sort the animals accordingly. This is a fantastic way to expand your child's vocabulary. Choose an animal that your child loves the most, and gradually name his body parts. You can start off by introducing the most distinctive ones, like tusks and trunk for an elephant, a beak and wings for an eagle. You will realize how quickly your child will spot that some animals have the same body parts. -or I do it the way shown on the photo- I place a certain food item and animals on a tray together, and then we discuss it. Next time I would prepare a larger amount of animals, and ask him to choose and place on a tray only the animals that eat that specific food. Kids are usually beyond excited when they start to understand the concept of counting. My son usually counts all of the animals he plays with, or sorts them into groups and then counts them. Having beautifully crafted items will encourage kids to do simple math activities. And here, again, the ways to play are endless. For the activity shown in a photo, I prepared some magnetic numbers, animals, and counting chips. I chose number 4 and asked my son to put exactly 4 rabbits on the tray. After he did that, he placed a counting chip under each of the animals and checked if he put the correct amount of animals on the tray. Kian has always been a fan of pretend play, and doctor pretend play is just what he loves the most. Sometimes his doctor kit becomes a vet kit, and he checks on the animals. The play is crucial for children, and it is a fantastic opportunity for us, parents, to pass on them the value of caring for others, including animals, through play. I remember playing this memory game in kindergarten. It is very easy to set up, yet so effective. 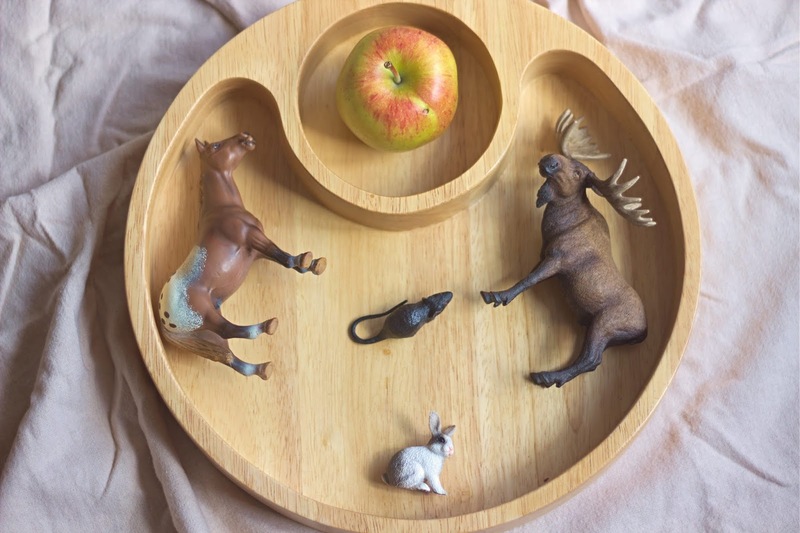 All you need to do is to choose a few animal figurines (you can, of course, add some other items), put them on a tray or a table and let your child explore them. Give him 1-2 minutes for exploration, then ask him to close his eyes (or turn around), meanwhile, you remove one of the figurines, and hide it under a scarf/ a bowl/ under the table. Your child needs to guess which one is gone. Have fun! Understanding patterns is an important skill for mathematical operations, logic and critical thinking. Your patterns can be as simple, or as difficult as you want. 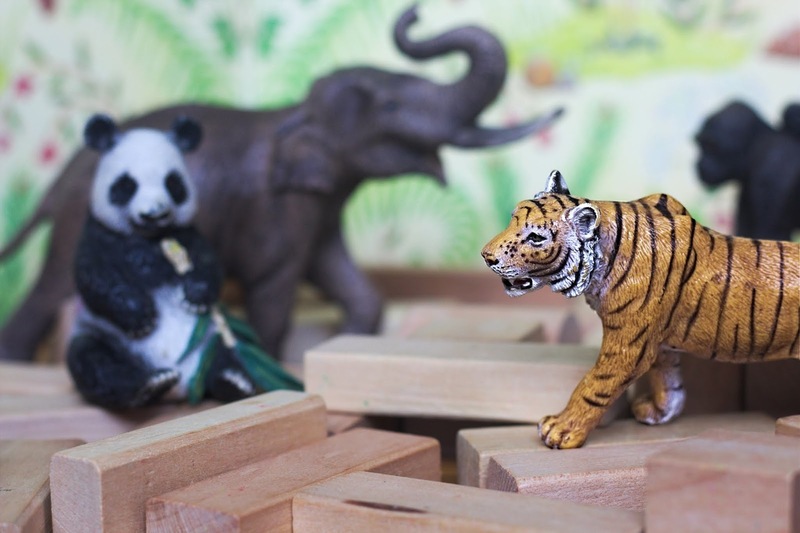 If you don't have many animal figurines for the activity, toss in some random items you find at home. Teaspoons, building blocks, clothespins. Anything! I went for the rabbit/horse pattern, but it could be as well spoon/animal/spoon/animal one. I have to admit that this is an activity I learned so much from! 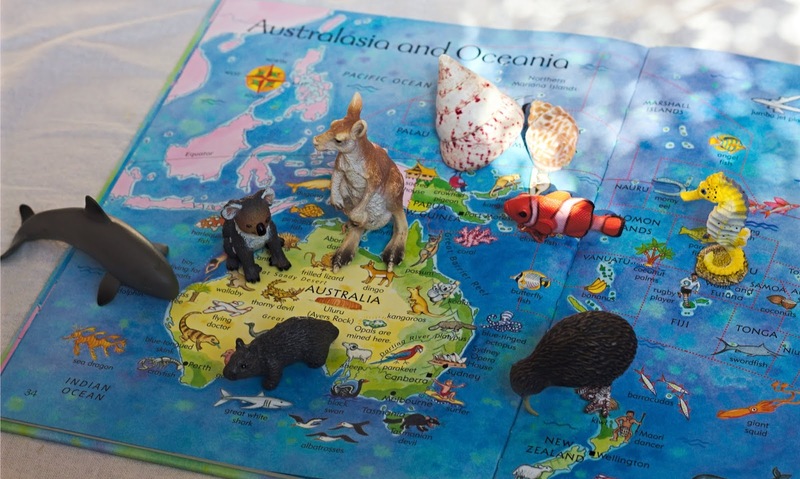 The set up is so simple- put animals on a tray and help your child to place them on a map of a particular continent. We usually use the maps included in Usborne Children's Picture Atlas, because they are kid-friendly, but you can use any map you want. I strongly believe that teaching your child phonics (or the alphabet) and counting makes sense only once they show interest in them. Otherwise, if introduced too early, it may put them off slightly. 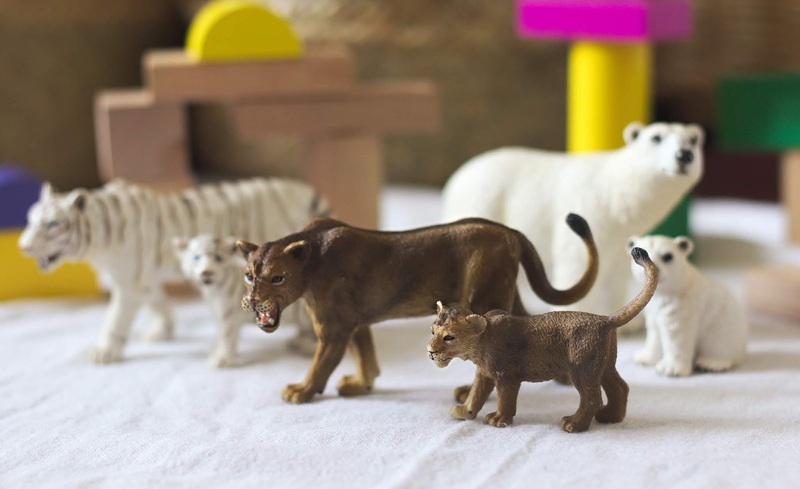 Animal figurines are just perfect for teaching phonics. The tiny ones would fit perfectly to a phonics (or alphabet) box. They are encouraging and fun. Yak: Schleich (2009). I love him! This can be an outdoor, or indoor activity, and it is the easiest one to set up. All you need is a little bit of sunshine (luxury goods, I know), a figurine, a piece of paper and a pen/pencil/crayon/colouring pen/ or a marker. Humanity has wiped out a ridiculous amount of animals in recent years. Thankfully, we are now all trying to stop that madness, and make more mindful lifestyle choices. We also need to nurture children's in-born innocence and love for nature, and we can do so by explaining the need to care for the planet and animals. I usually choose a few figurines and explain to my son what risk are particular animals facing (like plastic in the oceans, arctic ice melting faster than it freezes in winter). I have not I introduced him to some issues yet, like hunting, ivory trade or dogfighting, because he is simply too small. And important thing- how can we help the animals? We all can make a difference by not picking up foods containing the palm oil, wasting less plastic, water and energy. I recently found a fantastic book in our local library -'How to Help a Hedgehog and Protect a Polar Bear' by Jess French. It is a kid-friendly book which talks about simple ways to protect animals in different habitats, from the hedgehog or a bee in our garden to those living far away from us. 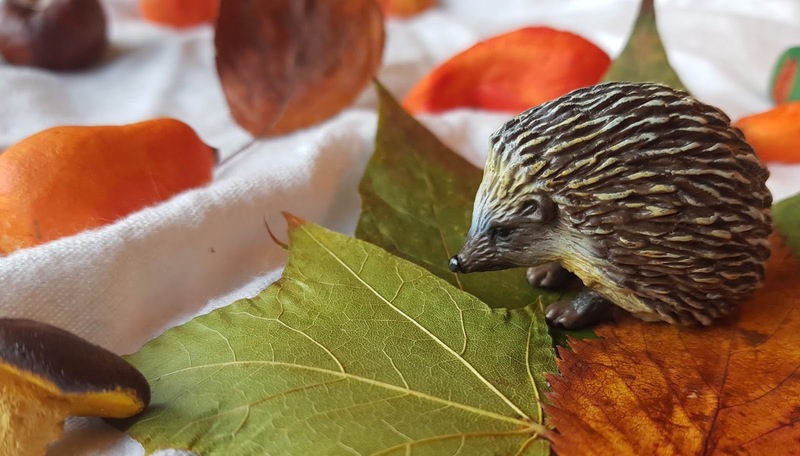 No matter if your child wants to draw, paint or sculpt, the beautifully made and detailed animal figurines can become fantastic 'models' for him. It is not only a fun activity but also a way to relax, communicate emotions and feelings, practice fine motor skills and boost creativity. From the size of ears and tusks for elephants to various, and possibly countless, differences between the breeds of dogs- there is so much that your child can learn. 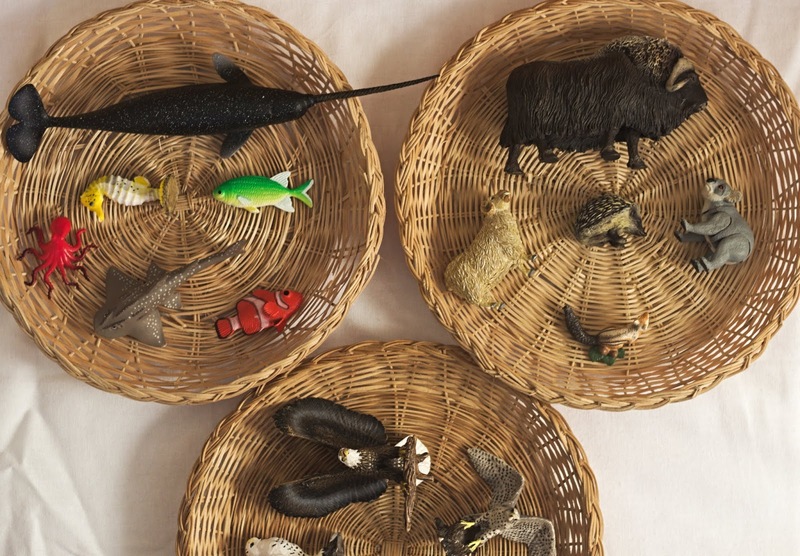 Animal figurines can be a massive help here, because they are detailed, and they allow your child to study their bodies without the need of having his hand eaten by a shark, or having to swim in the Arctic ocean in search of narwhals. But if they inspire your child to become a zoologist-awesome! 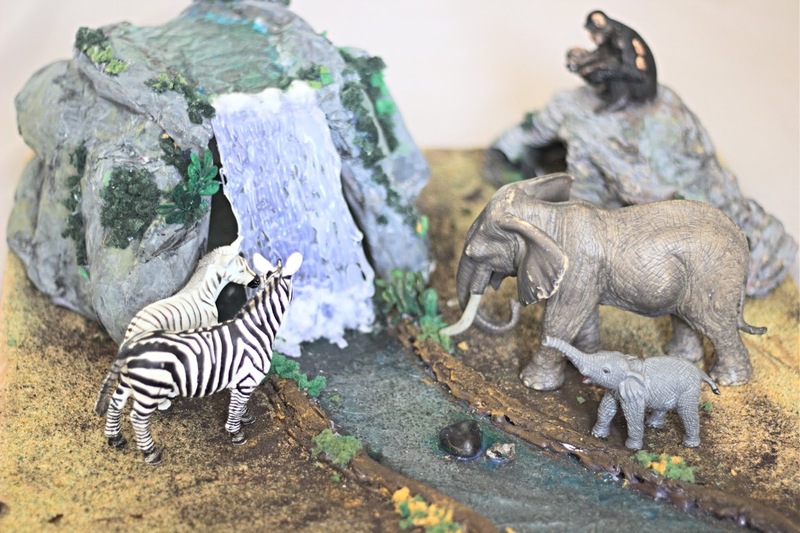 Making dioramas is one of the most creative activities including animal figures. It is very educational, as you not only introduce your child to continent study, sorting animals by habitats, teach them about different trees, plants and flowers, but it also is a fantastic art activity. The diorama that I have made was also a zero cost project, using 'rubbish' and some materials I found at home. You can find step-by-step instructions here. Discovering which birds are flightless will be very interesting for your child. 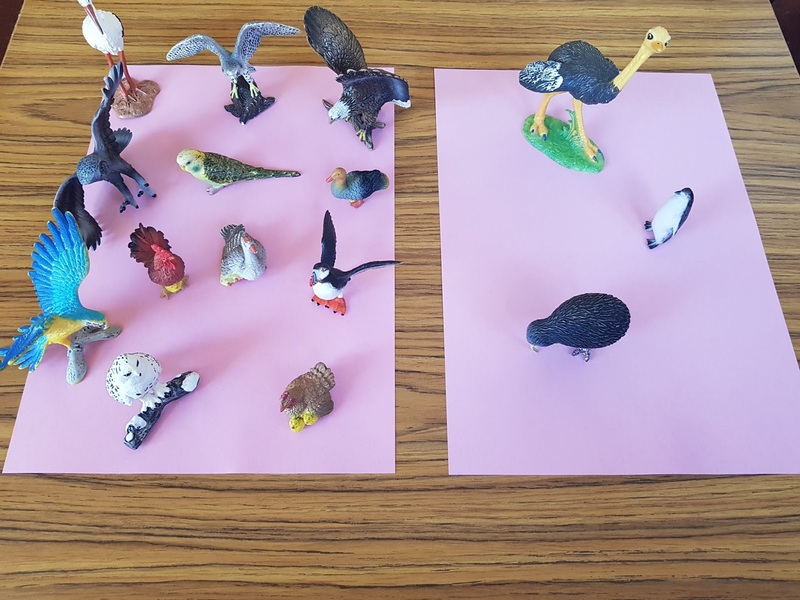 After you explain the concept of flying/ being flightless, you can encourage your child to start sorting the birds based on it. The more advanced is your child, the more information about the birds you can expose him to, starting with the name, the continent they live in, the food they eat, and- what is important- why they do/do not fly. My son loves to observe the fox that lives around our house form the balcony. He understood that the fox comes out of his den in the bushes in the evenings, which was a fantastic opportunity for me to explain to him that some animals are mostly diurnal, and some mostly nocturnal (this is how far I explained it to a 2-2.5 years old child, later I will certainly introduce more details). Then we started sorting them into groups, and I have to say that learning about animal activity times was fascinating for my son. Learning about animal food chain is the only one out of all of the activities presented today that my son has not tried yet. I simply struggle to tell him that some animals kill other animals for food. But if your child knows this already (or if you aren't a chicken like me), it is a perfect time to teach him about the food chain. 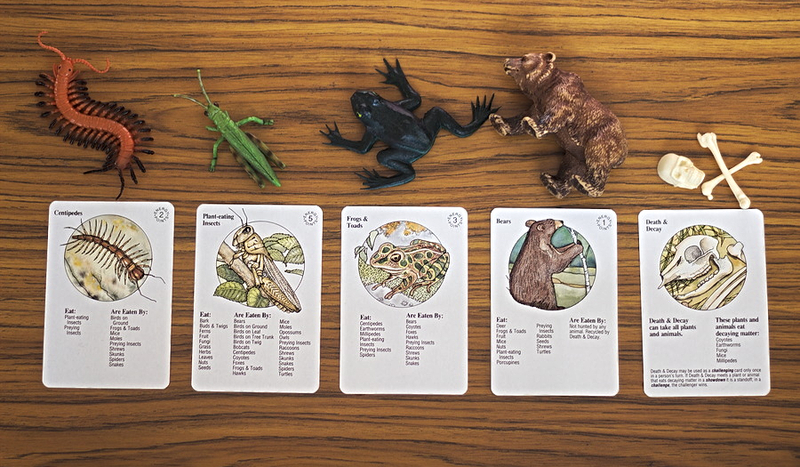 You can set this activity up in many ways, here I just used a few animal figurines, some parts of the human skeleton model to represent the 'death and decay', and some cards from a food chain game that we have at home ('Into the Forest, Nature's Food Chain Game' by Ampersand Press), but you can just print and laminate (or not) the cards with animal photos on them. You can always support yourself with books about the food chain because this is a topic that kids will ask thousands of questions on. These are all of the activities I prepared for you for today. Remember that kids are born with a natural desire to learn and grow, our job as parents or guardians is not to kill it in them, so keep the activities fun, don't pressure your kids, and enjoy watching how they develop new skills, learn new words and have fun playing. I have many more ideas for activities, so if you wanted a part 2, please let me know in the comments down below. Nature walks are great. We live in the country so we see a lot of farm animals and horses. So many wonderful ideas to play with these, I never would have thought about these at all! Holy moly, what a fab list of activities. I'm trying to get my son interested in animal figures as I used to love them as a child. 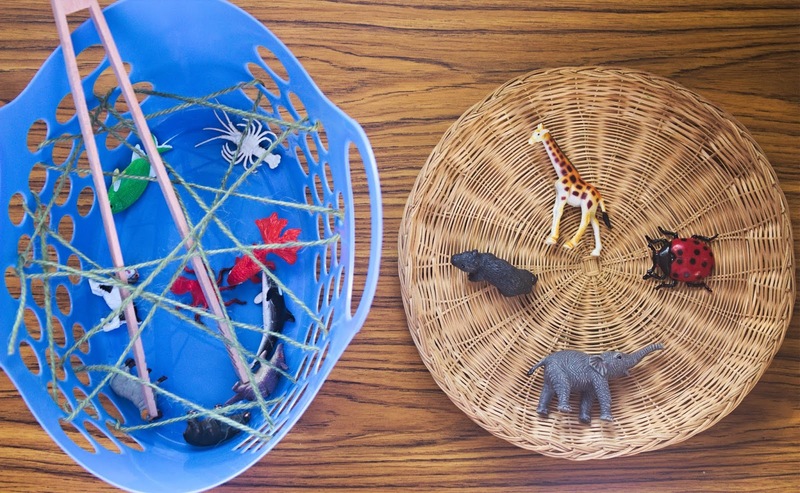 I love the foot print activity idea, a grwat way to combine animal toys and play doh. This is such a brilliant list! I LOVE this! 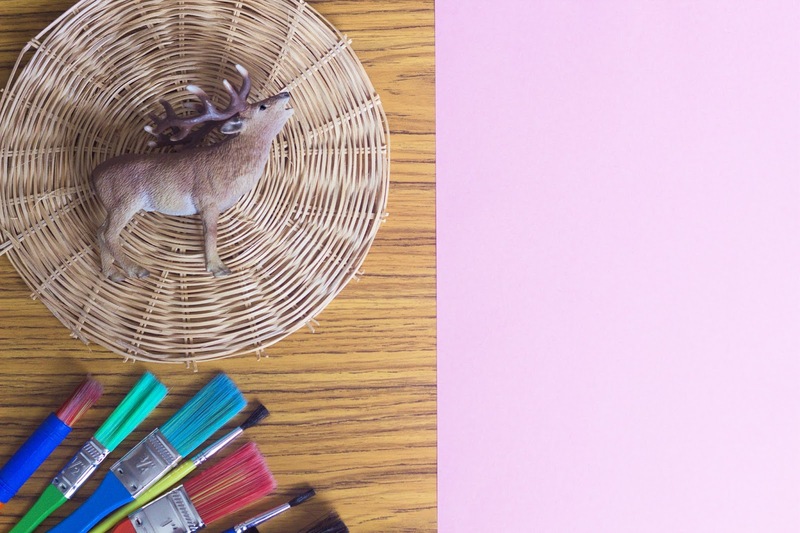 What an amazing post with so many fun activities! Everyone should read this! Definitely love these ideas, when my nephew was young sensory play was one thing he loved big time.